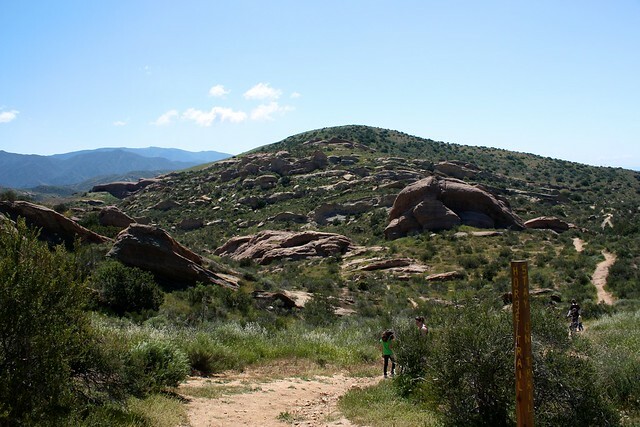 This 3.4 mile hike through Vasquez Rocks Natural Area highlights some of the fascinating earthquake geology of the area, as well as some recovering areas from a 2007 wildfire. 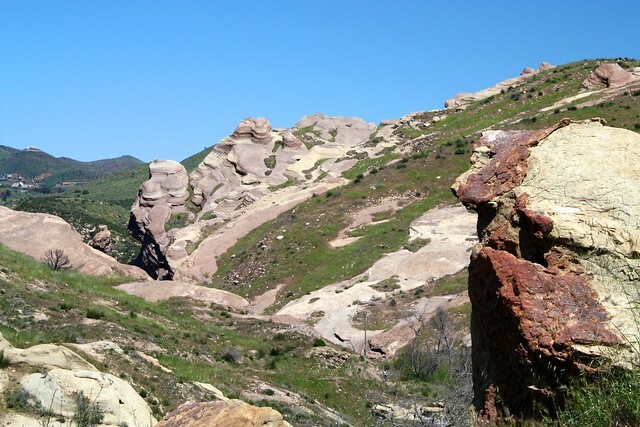 This park’s trails meander and wind their way through rocks folded and twisted into sharp angles by the San Andreas Fault and molded into even stranger shapes by wind and water erosion. 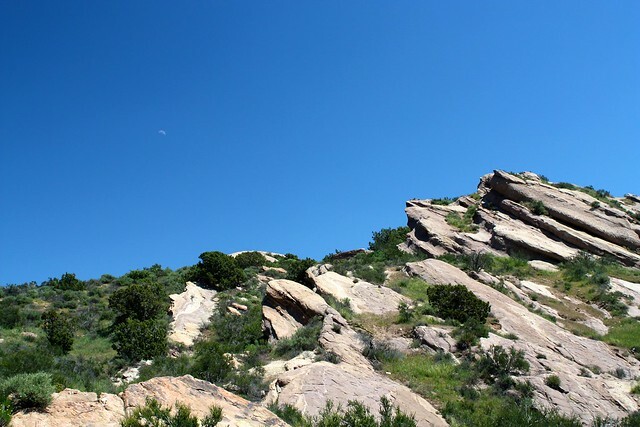 This is a beautiful and easy-moderate hike with routes suitable for just about everyone – plenty of opportunities to explore off-trail canyons and rock-scramble, too. 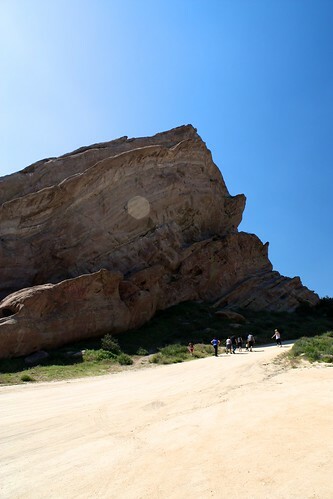 Vasquez Rocks is a 902 acre county park just off the Antelope Valley Freeway. 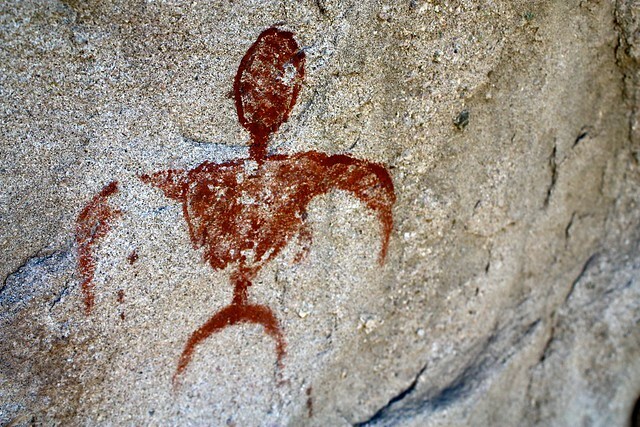 You’ve probably driven past it countless times – and chances are you’ve seen it in TV shows or movies, but even if you think you’ve already seen everything the park has to offer, these rocks are worth a visit. When you first visit, you’ll start out at the north end of the park. Drive down the dirt road past the first tiny parking area near the ranger’s station and instead park at the moderately sized spillover lot in the middle of the park. 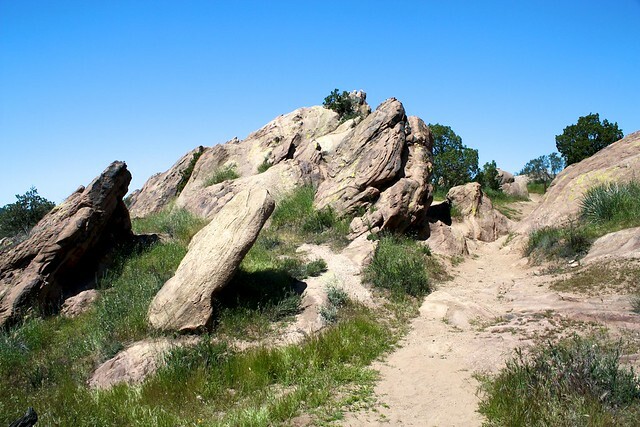 Most people will continue driving past the largest rock formation to an even bigger parking lot, but if you start off in the middle, you’ll get a nice base to start your loop of the park’s trails. At the parking lot, look for a bulletin board on the east side. Inside this bulletin board, you’ll see the very basic park map, as well as some pamphlets detailing some of the sights in the park. I assume this information is also available at the ranger’s station, but when I was there they only had the maps in a box outside the trailer. 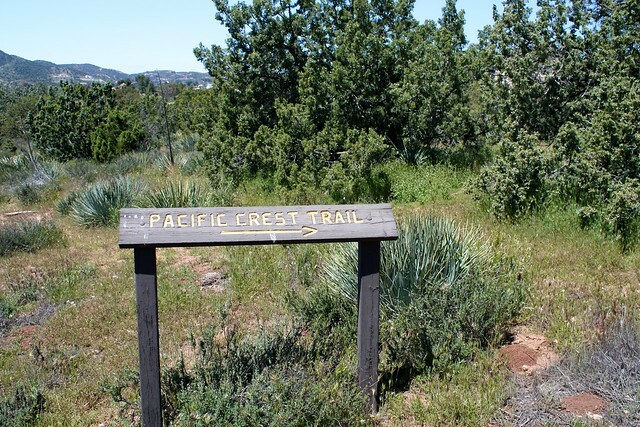 Look for a sign pointing toward the Pacific Crest Trail. Head down this short footpath and take a left on the PCT, heading back north toward the entrance. 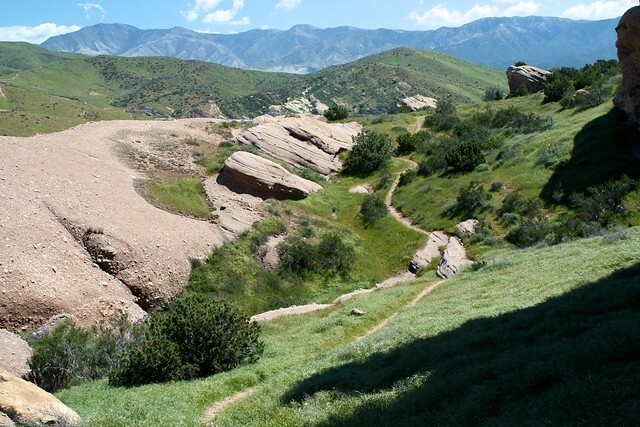 … and you’ll probably find yourself gazing back toward the “Famous Rocks,” but don’t worry – in a very short time you’ll meet up with the tiny Geology Trail, which shows off some of the area’s earthquake geology. If you’ve been to the Devil’s Punchbowl, it will look fairly familiar – strangely tilted slabs of rock, some at angles of up to 50 degrees. 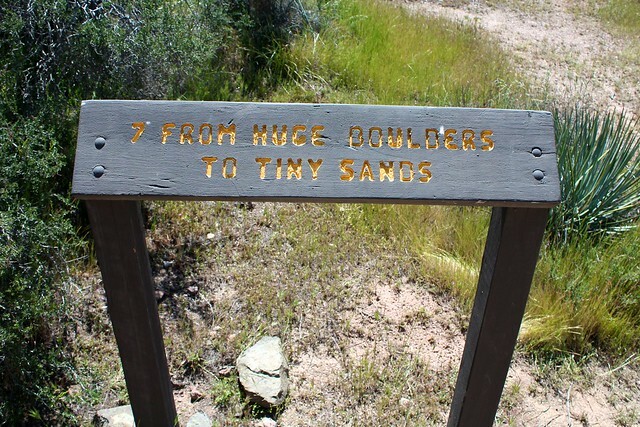 In about 0.3 miles, you’ll exit the Geology Trail near the ranger’s station at the park entrance. When I was there, it looked like they are currently in the process of renovating a visitor’s center and ranger station, so head toward the group camp area and continue south until you make out the History Trail (about another 1/10th of a mile from the start of the Geology Trail). Head south looking toward the Famous Rocks. In another 0.1 miles, you will come across a marked Tatavian area on your right hand side. 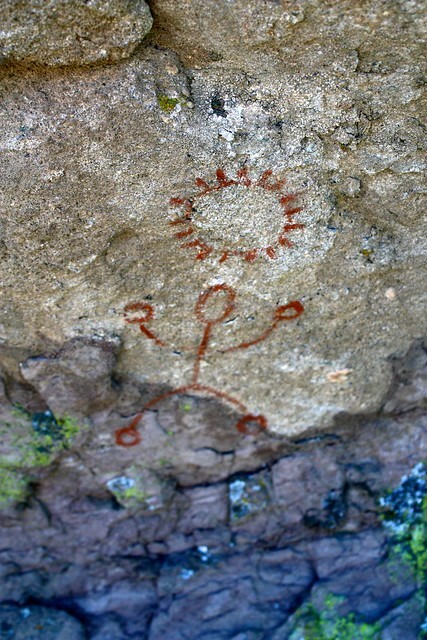 The small site has a few morteros and several prominent pictographs, which are well worth a visit. 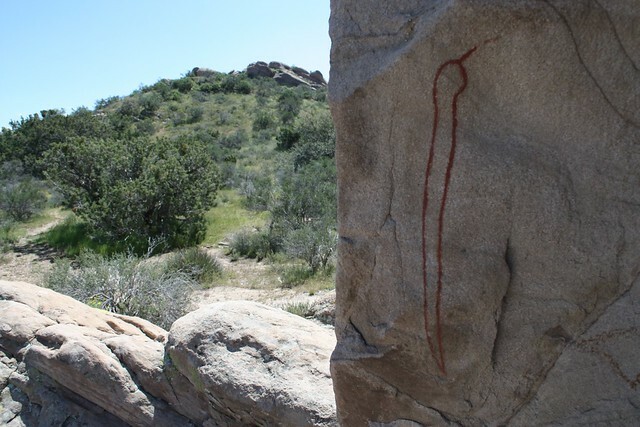 When you’re done, continue heading south on the History Trail until you get to a well-marked junction with the Horse and Foot Trail, which heads southwest away from the main rock formation. 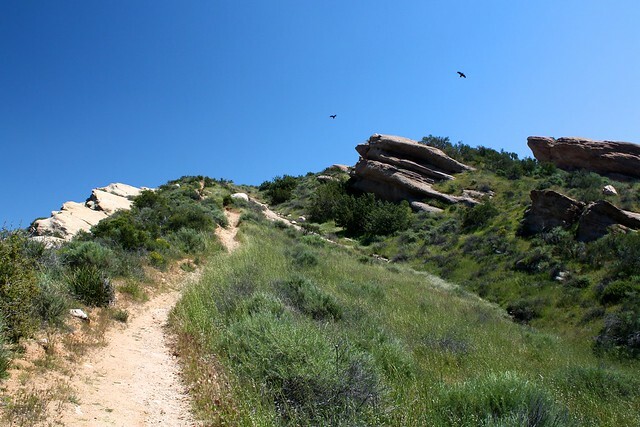 This trail heads to the far-less-crowded western half of the park, but first climbs over a prominent ridge. 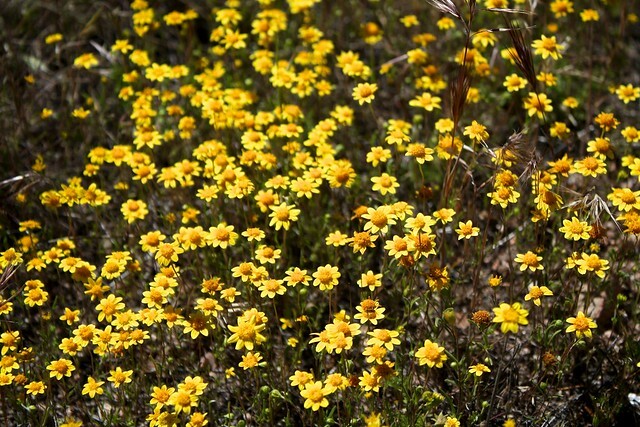 For some good views, take a short side-trip to both sides of the ridge at about 0.7 miles. 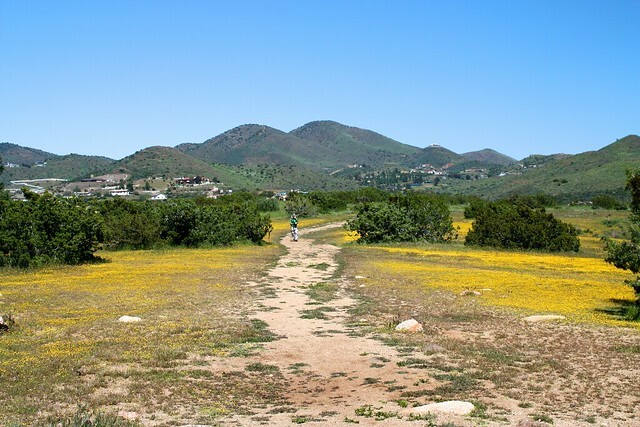 When you’re done soaking in the views, head back west on the Horse and Foot Trail. You’ll probably notice the crowds have drastically thinned now, and while there aren’t any rock formations as prominent as the ones you just hiked away from, the trail does meander through some very interesting valleys and gorges formed by the folding earth here. In this section of the park, there are several use trails and animal paths that branch off of the main trail. The trail junctions that are here are not very well marked, so pay attention to your surroundings. While the park is pretty small, it’s never fun getting lost when you’re trying to enjoy yourself in nature. Stick to the main footpath, and at about the 1.2 mile mark, keep your eye peeled for a post in the ground just above the trail you’re on now (I told you this area could be confusing!). This trail heads south after a quick climb over another ridge. 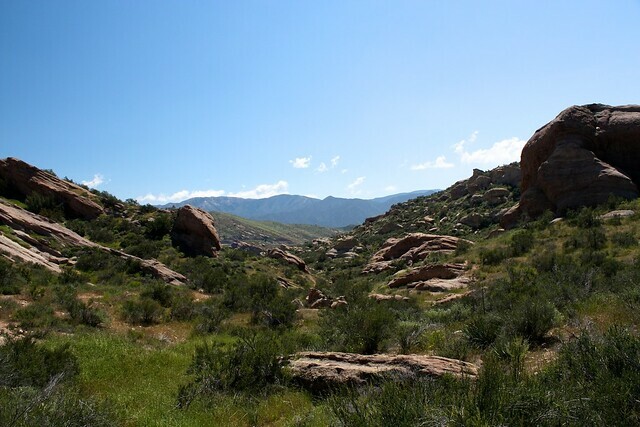 On the other side of the ridge, you’ll be treated to some gorgeous views of the unique rock formations surrounded by grassland, with the San Gabriels in the background. 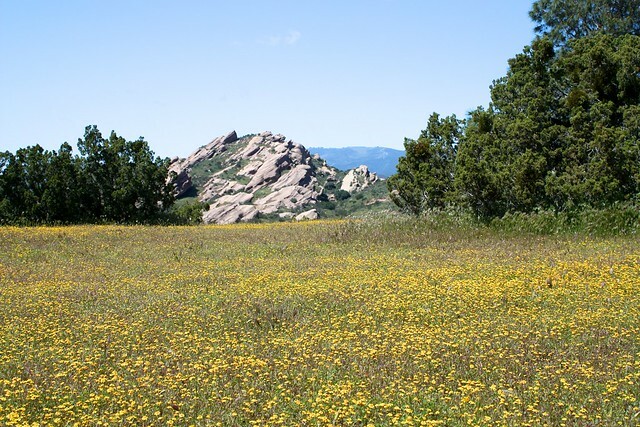 If you can ignore the CA-14, you can imagine this is probably close to what this area looked like when Tiburcio Vasquez was using these rock formations to hide from posses. From here, it’s a very pleasant 0.8 mile hike to the next junction. The trail here does fade in and out along the way, but it should be pretty easy to follow as it heads toward an old road at the southern end of the park. At about the 2 mile mark, the trail ends at an old road grade. 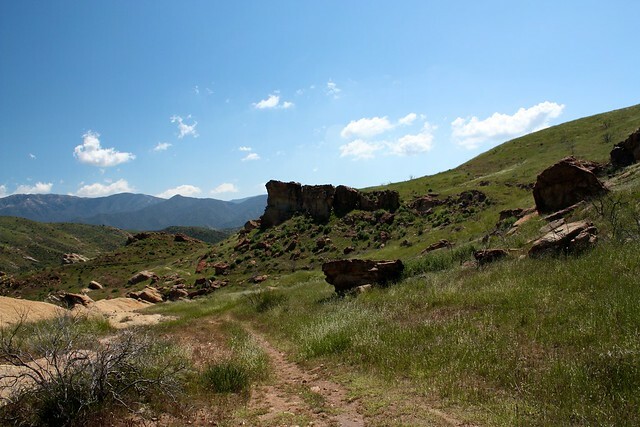 Take a sharp left on the road and follow it as it descends into one of the area’s folded canyons. In about 0.3 miles, the road comes to a 3-way intersection with another old fire road, which also happens to be the Pacific Crest Trail. Keep left at the junction and follow the PCT as it begins a moderate incline up a long ridge. 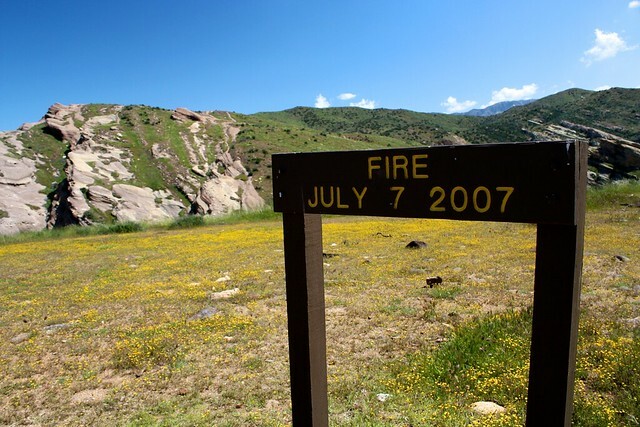 When you reach the top of the ridge, you’ll come across a sign marking a wildfire in 2007. The area is still devoid of any large trees, but it’s recovered nicely – and at this time, has a great wildflower display, too. When you’re done here, continue along the PCT / Dirt Road until about the 2.8 mile mark, where you’ll run into a vaguely visible junction. The PCT continues to the right along the more faint path. 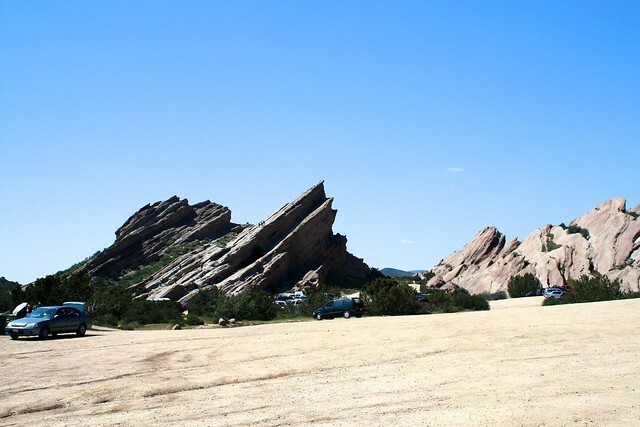 Stay left here to cross a large field and end up at the main parking area right in front of Vasquez Rocks. Once you cross the parking area, you’ll be face to face with the largest rock formations in the park – over 150 feet high. 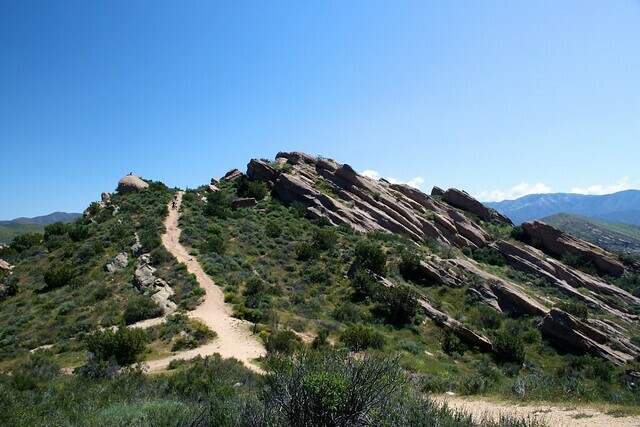 Depending on the time of day, you may have the entire place to yourself for scrambling, or you may be sharing it with dozens of other people … and maybe some Easter pageant participants on rehearsal, too. 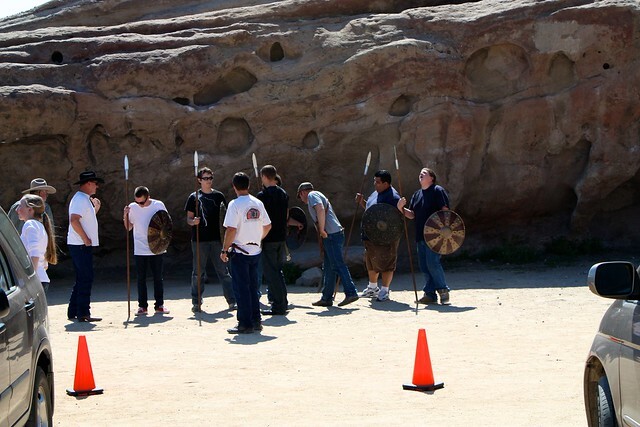 When you’re done scrambling around the rocks or staging your own Gorn battle, just hike along the dirt road through the rock formations back to your car. 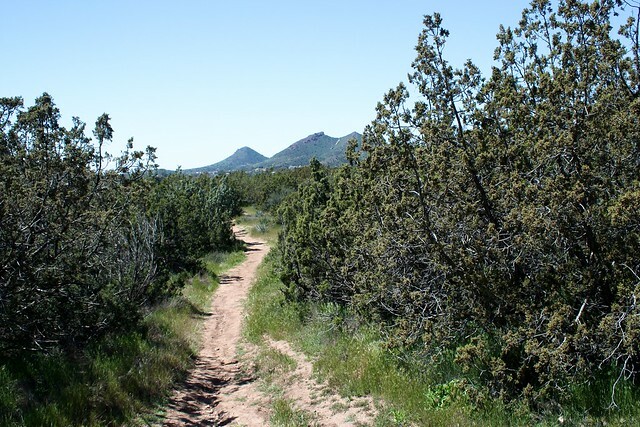 Good to poor - the more popular routes are signed and well-maintained, but many of the trails in the less crowded western section of the park are unsigned. 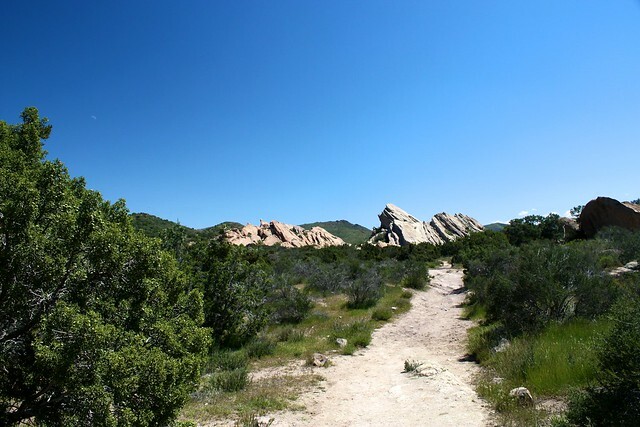 Additionally, there are many use-trails from animals and rock scramblers, so you can very easily find yourself on the wrong path if you're not paying attention. The Ranger Station provides a paper map, but there are no topographical features and it's not terribly helpful. 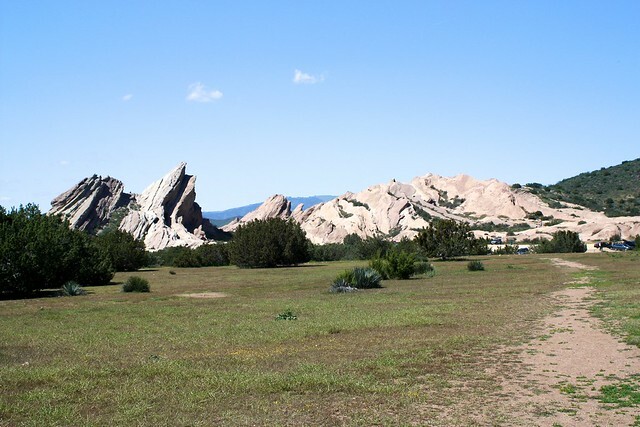 There is group camping inside the park, but currently reservations can only be made by calling the park directly at (661) 268-0840. From the CA-14 (Antelope Valley Freeway) heading east toward Acton, exit at Agua Dulce Canyon Road and head north, following the signs for Vasquez Rocks. 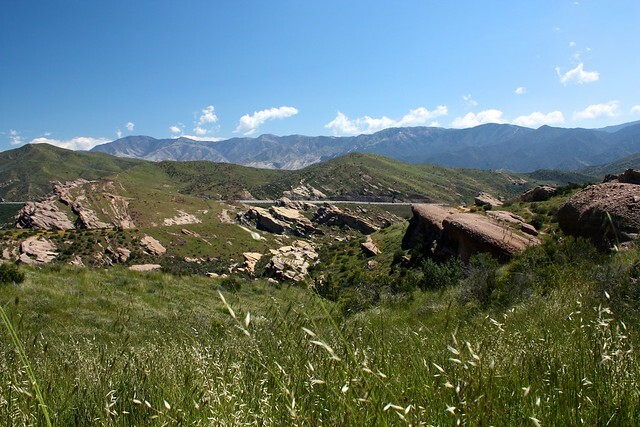 After a hard right hand turn, Agua Dulce Canyon Road turns into Escondido Canyon Road. 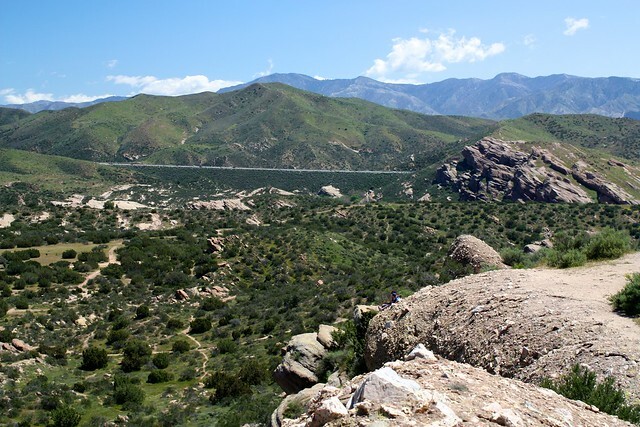 The entrance to Vasquez Canyon Natural Area will be on the south side of the road. There are no parking fees or passes required for the day-use area. 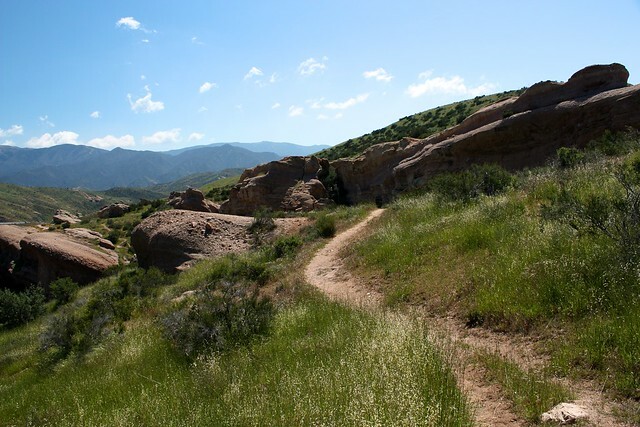 Today my husband and I ventured out to Vasquez Rocks and we thank you for your great trail description! It was so nice to get away from the crowds and explore this unique park. Cheers! Thanks Casey! Appreciate the reply! We're experiencing some technical issues with the site right now that are preventing those maps from showing. Sit tight - we're working on it! I love Vasquez - excellent trip report as always! It's probably worth noting that there is very little shade pretty much everywhere in the park and hikers should prepare accordingly.